MINNESOTA – “It’s all in the pan-bang,” baker-blogger Sarah Kieffer says of her unusual chocolate chip cookies. The Minnesota baker’s not-so-secret recipe had already been circulating on Instagram when the New York Times tested it out, and after the Times covered it, it went viral. Kieffer detailed her technique after food writer Julia Moskin became intrigued by the attention the funny-looking cookies—”as wide as a salad plate and flat as a flounder”—were getting online. She assumed the “mutant” cookies copied by food blogs were a “cry for help,” and she sought out the creator. Kieffer didn’t hold back, revealing how she makes the unusual ringed edges by opening the oven after the cookies have slightly risen and giving the baking sheet a good slam on the rack or on the top of the oven. She repeats the whack a few times more during the baking process, sending ripples fanning out from the center. The result is a distinct soft-crunchy texture that Moskin proclaims to be “a leap forward in cookie technology.” Kieffer says she has no idea what inspired her to try the pan-bang. 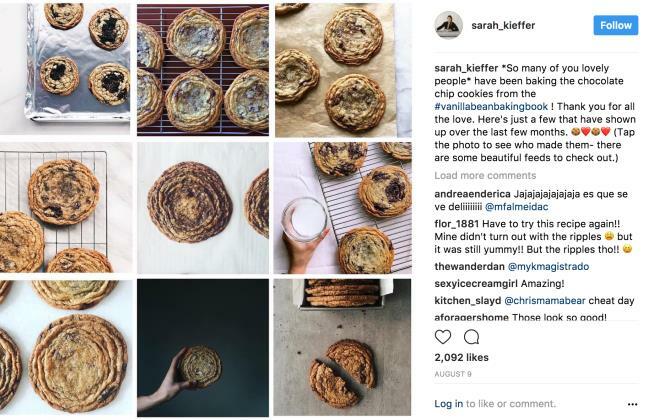 “I can’t imagine a better chocolate chip cookie,” says Kieffer, whose cookie glamour shots have scored more than 2,000 likes. “I still can’t believe it,” Kieffer tells the Star Tribune. “It’s so exciting.” Kieffer has other tips: she uses chopped chocolate rather than chips, and she chills her dough balls. Briefly freezing the dough helps it keep its shape, and it keeps “the centers gooey, and the edges crispy,” she says. But Kieffer knows her time in the cookie limelight is limited. “You never know what someone else will think of,” she tells the Times. Get the recipe here. Should you eat three big meals or many mini-meals?